This was it, we were finally going to The Rex for some best jazz bar in the city, so we could finally cross it off the list (and then never ever go there again). We had it all planned out. We would go for the earlier show! Before the show we went to Rock Lobster (yes, the song by the B-52s of the same name gets stuck in my head every time I hear that) for best lobster roll. 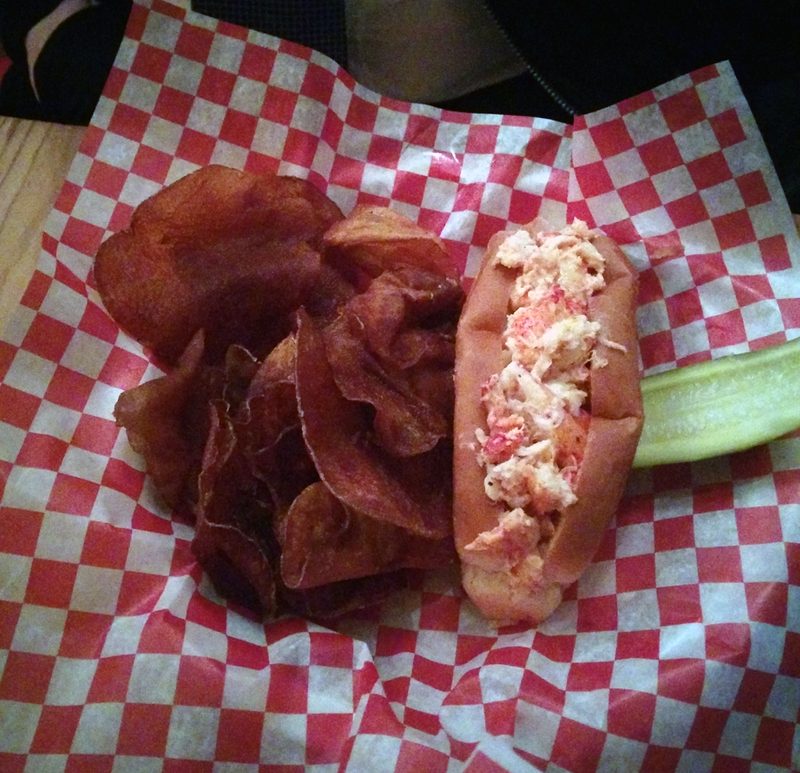 We were both rather skeptical with regards to the lobster roll, as in the past lobster and lobster rolls have proven to be too much (it is one of those foods that you can only eat a small amount of it, and very quickly it becomes too much). Usually there is too much mayonnaise, or it is just a giant heaping mess that halfway through you are sick of. The plan was to switch halfway if that were the case. I had originally wanted to get the lobster mac and cheese, but it had recently been taken off the menu. 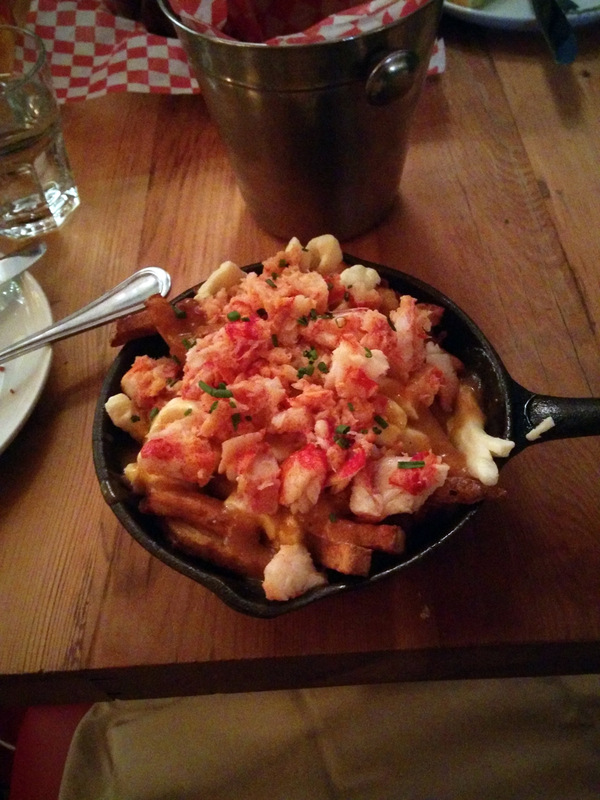 No worries though, I got to order the lobster poutine (I was torn between the two). 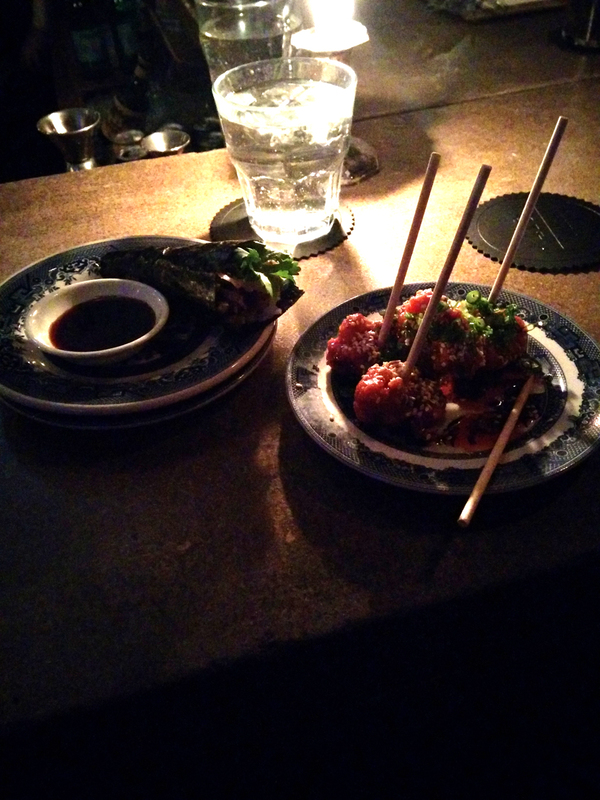 I was voraciously hungry, and insisted on splitting an appetizer. We ordered the fried clams with corn- popcorn that is. We were presented with a small metal bucket full of popcorn and fried clam bits all drenched in bacon bits and grease. 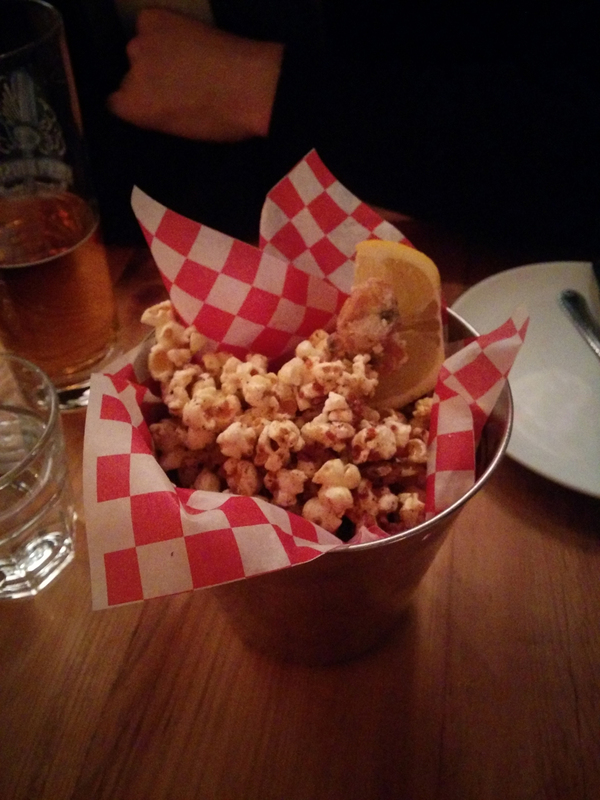 It was an odd combination, the clams making up for the popcorn’s lack of crunch. It was also a terribly messy affair, there was no eating it with a fork. The poutine was served in a skillet and it was the neatest, most nicely organized poutine I have ever laid eyes on. The fries with gravy were on the bottom, then the cheese curds were evenly spread about with a generous heap of lobster meat squarely on top. And I wrecked it all with my fork, making sure I had a piece of each all on my fork all in one giant bite. It felt like there was gravy all over my face. The gravy did manage to overpower the lobster a little bit, but the real winner in the whole mess was inexplicably the cheese (I say inexplicably because I am not a big fan of cheese). The lobster roll was amazing (well, the two bites I had). The bun was as plain as it gets, thus not taking away from any of the lobster flavour. The mayonnaise was subtle and barely noticeable, just enough to hold everything together. Nothing fancy to it, just the right amount of mayo to lobster ratio and a plain white bun that managed to hold everything in. Perfection. We finished just in time to walk over to The Rex. The band had just taken to the stage, alas all the premium seats had been taken and we had a long table all to ourselves. 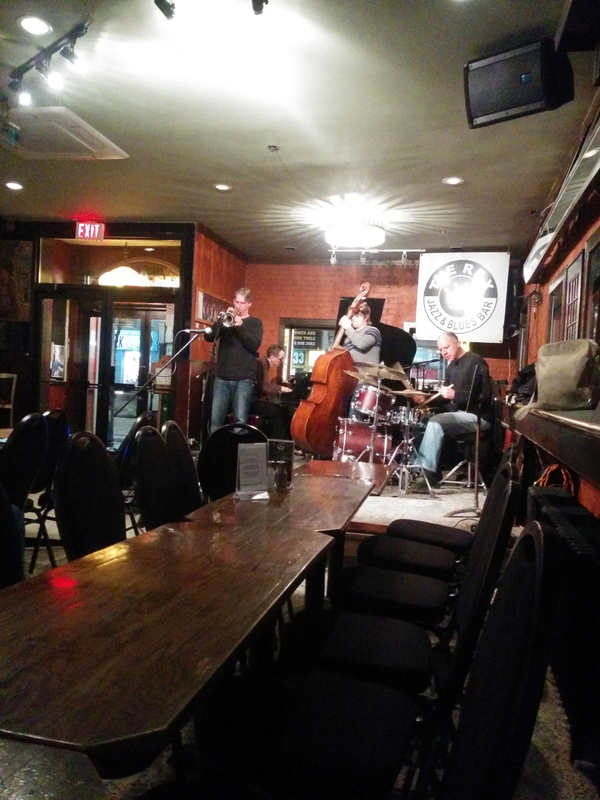 I was honestly surprised at how many people were at the jazz bar, for 6:30pm on a Wednesday when it was damn cold outside. It was nice to sit and relax with a cup of tea while the band played, even if the bar itself is blech and not to my liking. I swear I went in to Loblaws just to buy milk, but as soon as I laid eyes on some fresh green tomatillos, it was settled: I was making chili! To be more specific: turkey chili. I did this a little backwards, going grocery shopping before looking at the recipe- I admit it. It did not help matters that I was voraciously hungry. Thankfully I had saved up my points (one of the upsides of living off my credit card) to pay for it… and so I paid $1. Hah. I got home and looked up the recipe for easy (fine, child-friendly) turkey chili.Having the measurements for spices was what I was really after, I had a mind of my own as to what I was going to throw in and how I was going to prep the turkey meat. I fried the minced turkey, but using chicken stock instead of oil. I was pleasantly surprised when that actually worked out fine (I was rather skeptical given my usual healthy short-cuts end up as failures). I tossed stuff in the crockpot: beans, corn, tomatillos, mushrooms. I did not have any tomato sauce so I added some spaghetti sauce (it is made with tomatoes) and figured that the rest of the tomato flavour would come from the tomatillos (I assumed they were of the same family- they are not). Continuing with my “witch over her cauldron” streak, I threw in some hot sauce and orange peppers just for good measure. After adding the turkey I realized something terrible: there was no more room in my crockpot! It was crammed full. I glanced at my still-half-full container of mushrooms and shrugged. Oops. The turkey chili came out amazing. Easily one of the best recipes I have ever cooked. In fact, it has turned me from a bean-hater to a chili-fanatic (i.e. : I no longer eat around the beans). Turns out that red kidney beans are really good when they are cooked for a long time until they reach a mushy consistency. I am officially a chili fanatic, so much so that no sooner had I polished off that batch than I found myself yet again in the kitchen frying up some ground turkey. This was another unanticipated chili. 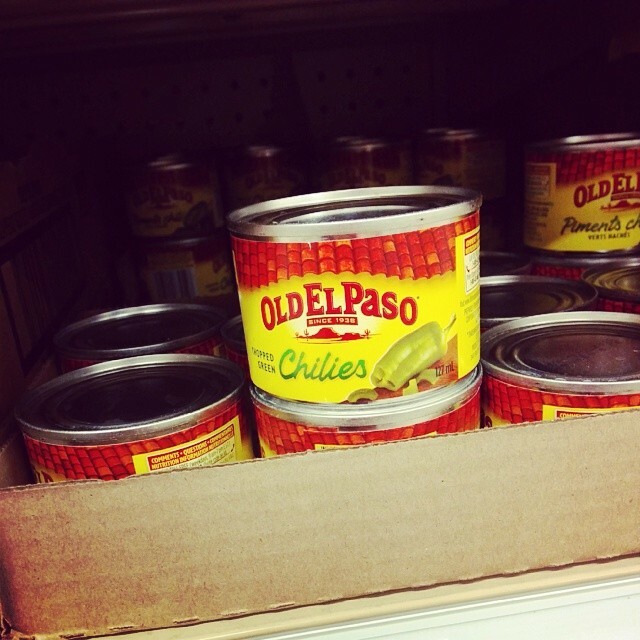 I was in the grocery store and I found a lonely can of chilpotle (the label had a typo) peppers in adobo sauce. My eyes widened, I had been looking for that for almost a year!! For what recipe, I really cannot remember. (Maybe I should have saved them, will I be able to find them again?). This time I did not have any green tomatillos, so I added some green tomatillo salsa to the crockpot along with half an onion (which I lacked last time). After a while I was curious and tasted some- holy God it was hot. And I don’t just mean the temperature- it was a damn spicy chili, maybe two and a half alarm? Turns out chilpotle peppers in adobo sauce are spicy!! And of course there were jalapenos in the green salsa. It was a good thing I resisted adding cayenne pepper to my chili, maybe next time. We broke protocol* and went out on a Friday night, but it’s ok, we had reservations. We were anticipating having a price fixe meal at Lamesa, voted best prix fixe AND best filipino food in the city. Turns out they thought otherwise, Lamesa no longer has a prix fixe menu. Going for the prix fixe, we had anticipated dinner taking 1.5-2 hours, leaving us just enough time to walk over to The Rex for some jazz at 9:45pm. It just wasn’t meant to be- again. The Rex was becoming another of those places that it would take us forever to cross off the list, up there with Aunties and Uncles as well as Grand Electric. I tried to remember what was on the prix fixe menu that is still listed online, but the only ones I could remember were the fried chicken (which I wasn’t even in the mood for anyways), the noodles and steak with banana frites. I opted for the meat and rice dish. 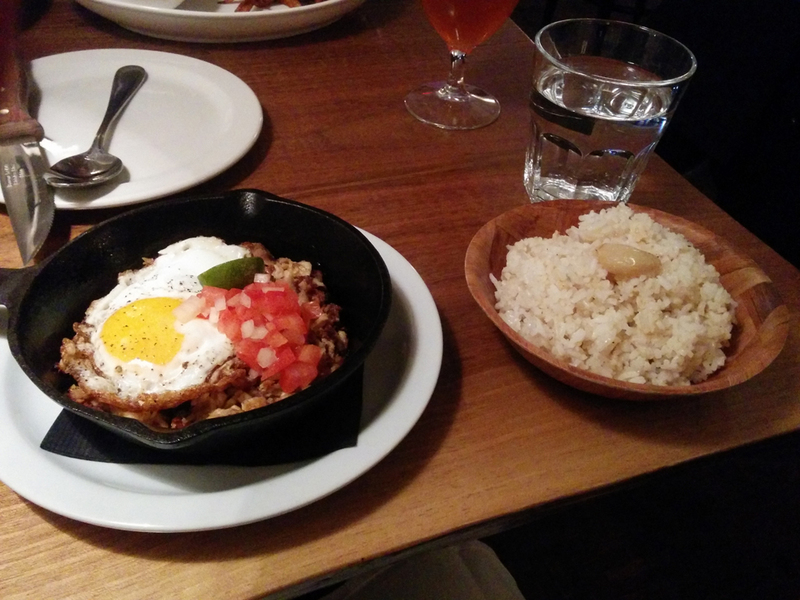 I was presented with a skillet full of meat (pork, chicken and beef) complete with a fried egg and diced tomatoes on top and some garlic rice on the side. I was worried at first, I hate egg yolks and tomatoes, but I managed to mix it up with everything else and the rice The only thing missing (or drowning) was the promised chiles- but I only realized that halfway through. It was so good I barely had time to stop and realize it. I had a tiny little bite of a banana frite, it was surprisingly not that bad- as in, it did not taste like banana. Brent said that they did taste like it, I guess I missed it by having just a nibble. 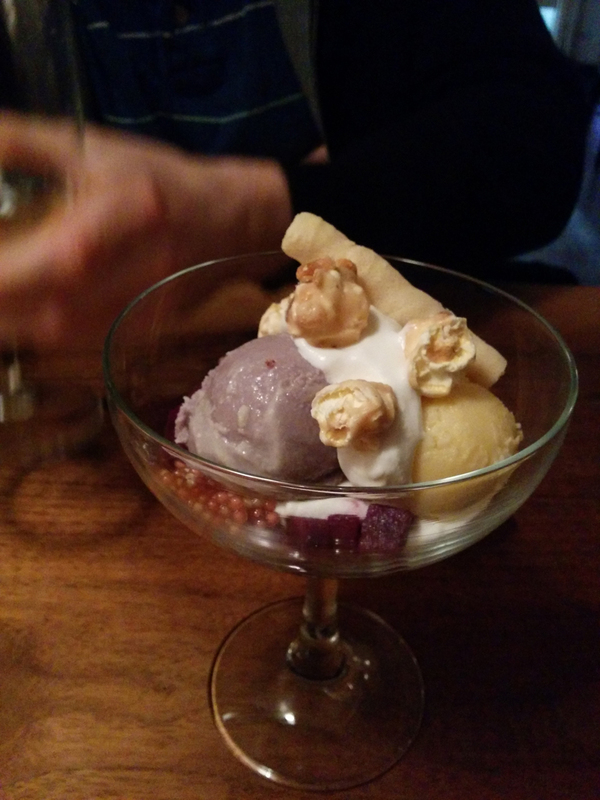 We split a dessert as well in trying to recreate the prix fixe menu. The waitress suggested the sundae, which we had already decided on beforehand, but her rave reviews only made it seem that much better. There were two ice cream flavours: coconut and another flavour topped with whipped cream, caramel popcorn and a wafer roll. There were also pieces of ube (a purple yam) that were prepared in such a way as to taste like weird fruit, not yams. Even with Brent ordering a second beer and us lounging, slowly eating our sundae we were done before 8:30. There was no way we were going to sit around The Rex for almost an hour (it is a dingy mouldy dive which I contend was voted best jazz bar because it is one of very few, maybe the only one in Toronto). We got home before the band even started. We had tried to go to Sansotei Ramen for best ramen once before, but we had made the mistake of going around 6pm, when everyone is hungry for ramen. Of course, there was a line-up out the door and we bailed. For our second attempt we planned it out much better. This time we would go when the place opened, 11am on a Saturday how could that possibly go wrong?! 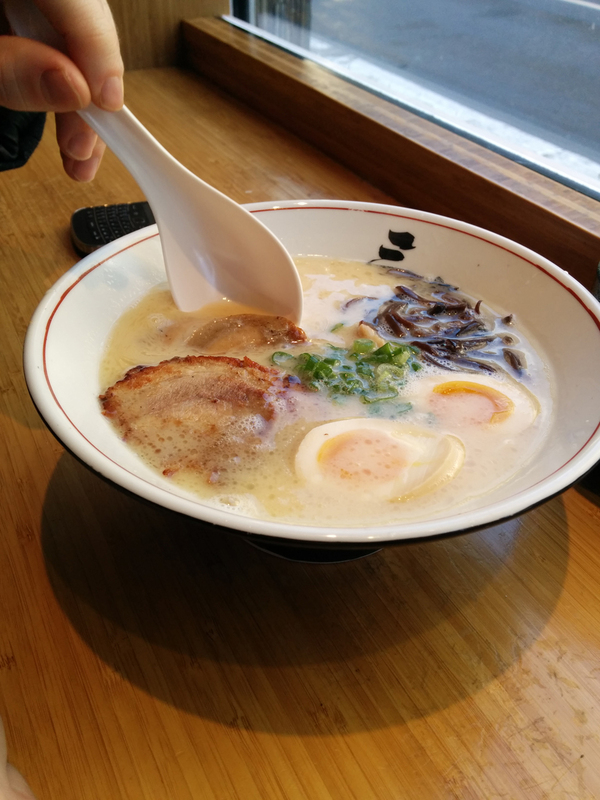 Having barely slept the night before (not out of excitement, but because of work) it was amazing that I got out bed before 10am yet I was so slow and sluggish that we made it to the ramen place at 11:30am. As we walked there, passing by ominous clocks showing that it was past 11am. 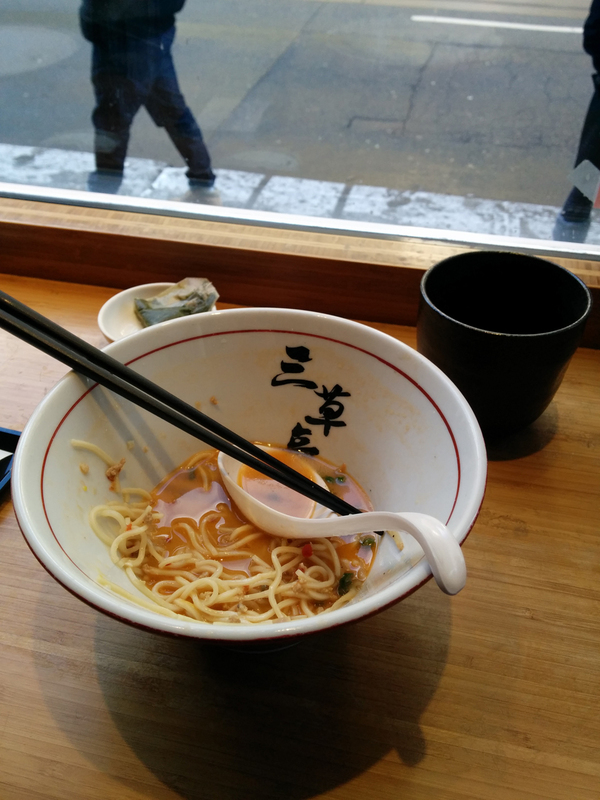 I wondered if it was really possible that the place would be so busy on a Saturday morning, it’s just ramen, not exactly a brunch food. Turns out I was wrong. We got the last two seats. As soon as we sat down I realized why they were the last ones left: no one wants to sit by the window, facing out. It was awkward watching people walk up to the restaurant and get turned away and told to come back later. Things only got more awkward as our food arrived and people could see us eating. It was awkward trying to eat the ramen as the noodles were too long to eat with spoon. I spent a lot of time chasing noodles with my chopsticks. Given the awakrd nature, we did not swap bowls halfway in. It was hard to eat half the broth and half the noodles, then switch. Plus, I did not want to give mine away, it was so good. I had gotten the spicy one that was available in limited quantity (so they said), while Brent had gotten the original one. He had a sip of my broth and agreed, I had won. 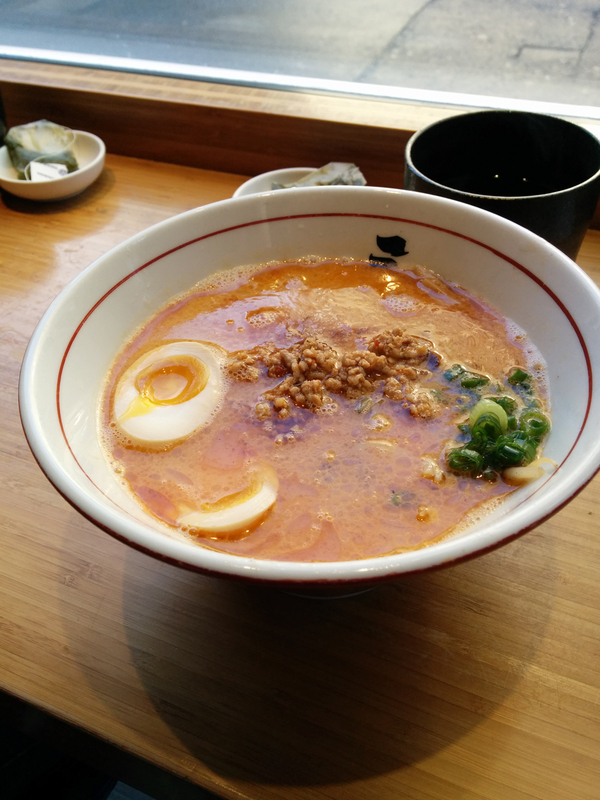 The ramen was delicious, despite being hard to eat at times. The only part I did not care for was the egg, I hate egg yolks unless they are disguised as in french toast or omlettes or better yet: cakes. The pork belly was actually good, the broth had a strong enough flavour to distract me from the fatty texture of it- which I usually find off-putting. Also: beware, the portions are huge! After two failed attempts at making dessert last night I was fed up and furious. Enough was enough (saying of the week? ): I was in the mood for dessert, proper dessert, not something you would bite and hope it did not kill you. 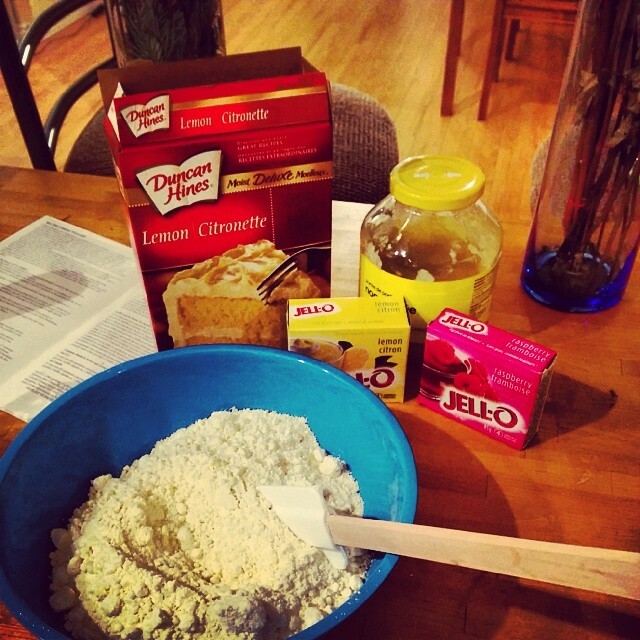 Years (I mean, years, really) ago I had attempted a Jell-o poke cake. The recipe called for a “pudding based” cake mix. I searched and came up empty handed, decided to risk it. I really do not remember what happened, but all I know is that there were no Jell-o bubbles throughout my cake as promised. I shelved the idea for “one day when I find pudding based cake mix” and let it be. Then, a few months ago I found a pudding based cake mix, rejoice! Only it was an epic flop (and thus I swore off Dr. Oetker cake mixes, sticking to the basics that I know are good: pudding). With furrowed brow and a giant mess in my cake pan, I yet again shelved the idea: clearly this was going nowhere. Fed up with my string of failed attempts at dessert (seriously, it has been a bad streak, a month and a half that thankfully was filled with Christmas chocolates and my mom’s cakes) I threw my arms up in an “I-give-up-rage” and decided to go back to basics: box cake. But being the creative (that may be where all my problems stem from) type I could not live with just making a box cake- it had to be more elaborate. The recipe called for- unbelievable, get this- adding pudding TO the cake mix. So simple, I cannot believe it took me almost 10 years to get to here (told you it was long ago). I have been craving lemon lately, so I added lemon pudding to lemon cake mix. For the Jell-o I went with the classic (in terms of going with lemon) raspberry flavour. 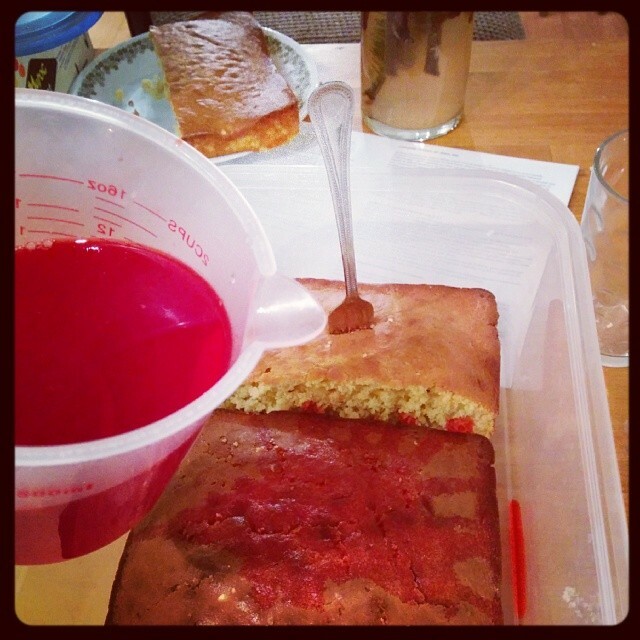 I was so eager to pour the raspberry Jell-o all over my beautiful square cakes… that I forgot to poke the holes! Thankfully I had barely poured any before (panickedly) realiizing my mistake. I must admit, stabbing the cake with a fork (gently) is a great stress relief. Plus any of the little bits that may fly off, you get to eat. I have never gotten this far in the recipe. You have to leave the cake in the fridge for 3 hours. An unbearable 3 hours when you have been dessert-deprived for weeks. I even had some Jell-o left over.. but oh wait, that also has to set. WHAT AM I SUPPOSED TO EAT IN THE MEANTIME?! you may ask: I thought ahead. You see, I anticipated this being a messy affair and so I put the cake in a giant tupperware. Alas, the tupperware was not big enough and I had to slice off a bit of one cake (easy to choose, it was the one that lost a piece of its bottom sticking to the pan). And so now I have a small piece of cake to munch on while waiting for my creation to set. This had better turn out or else I have lost all faith in the universe. As of late, nothing has been turning out in my kitchen. It is half due to my lacklustre attitude, replacing things when I don’t have them (for example making an equivalent to buttermilk by adding a tablespoon of vinegar to a glass of regular milk). This has to stop. So many times I have looked forward to eating something only to have it flop and my newfound craving go unfulfilled. Plus all those baked goods are never good for the waistline. Hence my new plan: I will bake sweets once a month, BUT I will follow the recipe as is (i.e. : no more subbing in apple sauce/greek yogurt for butter/margarine). I will also buy the necessary ingredients whenever possible (I did manage to find green chiles the other day, I thought they were forever lost to New Mexico). And slowly but surely I will amass the kitchen gadgets I need to ensure my successes* (scale, donut pan, etc..). * My mixer just broke, add that to the list. I was recently flipping through the Beer Bistro cookbook and I happened on the recipe for steak tartare. 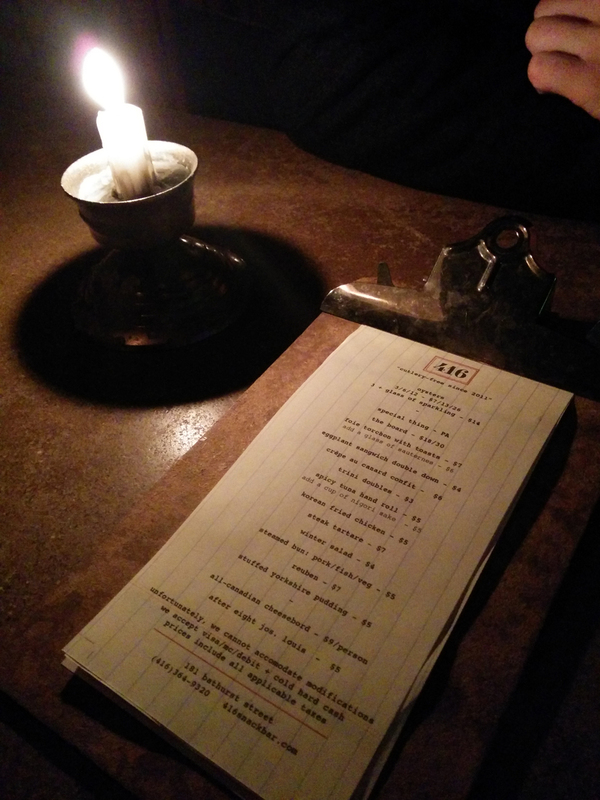 Brent mentioned that 416 Snack Bar had just been voted best steak tartare in the city. Our dinner plans for the next day were set: we were going to a snack bar! I was a little wary about our plans. 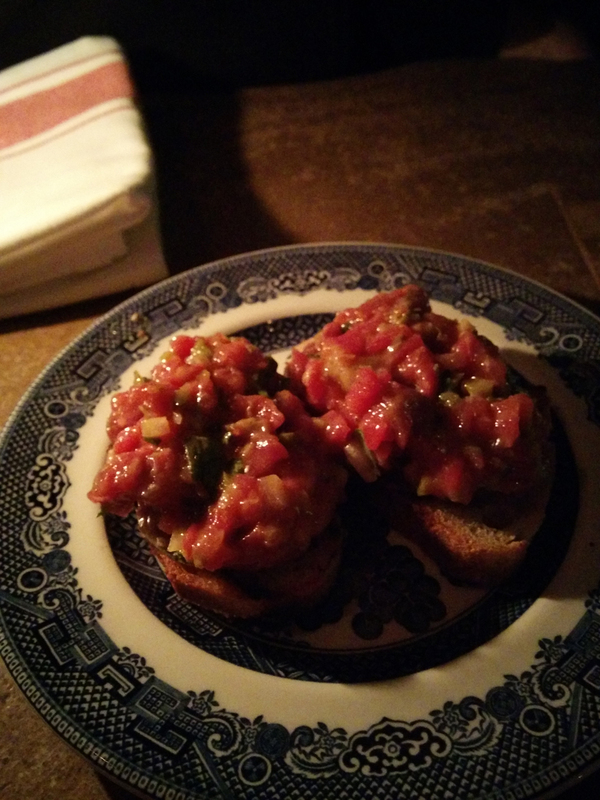 For one thing Black Hoof and Beer Bistro both serve up amazing steak tartare, would 416 Snack Bar really be able to beat it? It was on par with them but it is hard to say it was the best. I was worried before when I saw on the menu that their whole thing was that the meals were “utensil free.” How on God’s green earth are you supposed to eat steak tartare without a fork?! Easily when it is served to you on a slice of baguette. The real knock-out was the chicken, it was spicy and saucy and delicious. Thankfully that one was served with a wooden skewer sticking out so your hands stayed clean. I was not too keen on the spicy hand tuna roll, it was tasty, I was just not in the mood for sushi. 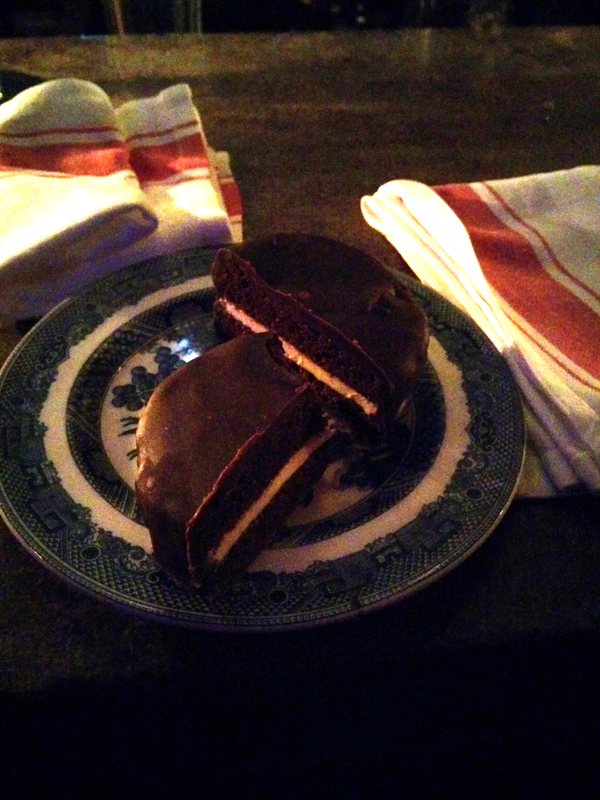 The “After Eight Jos Louis” was a cruel punishment: I loved the cake and the chocolate coating but hated the middle which was minty cream cheese. It looked so tantalizing and I was constantly tempted to take another bite, despite my dislike of mint. 416 Snack Bar is rather small. We got there and it wasn’t too busy, but soon the evening rush arrived and we got moved from our table up to the bar (one of the downsides of being a party of two) and then we had to move down the bar again to make even more room. Towards the end it was getting uncomfortably crowded. The service was fast and we barely had to wait between dishes. On the way home we stopped at The Rex, to listen to the city’s best jazz but the band had just finished and the next one would not be playing for another 2 hours or so… we bailed and headed home. I was still hungry, snacks are no substitute for dinner.